Because it has been in such short supply this past year, I am going to start this article with the good. On Wednesday we heard that the BLM had rescinded a 2018 Wild Horse and Burro sales policy change that had made the possibility of huge numbers of wild horses and burros being sold to kill buyers and eventually ending up at slaughter a virtual certainty. Under this 2018 policy, a single buyer could purchase up to 24 wild horses or burros per day with no limitations, no questions asked, no waiting period. The horses and burros were sold at $10 per head. We do not know how many of our wild horses and burros were sold under this policy, while the Bureau of Land Management, who is charged to manage and protect them, looked the other way. The only way to find out the actual numbers, which we assume will be in the thousands, is by a Freedom of Information Act Request, but the BLM is now taking months to release information to members of the public filing requests. The good news here is that now this policy is no longer in effect and now the BLM is back to following its 2014 policy that limits buyers to purchasing only up to 4 wild horses or burros every six months unless they have special permission from the BLM’s Washington D.C. office. Buyers also have to sign a form that states that they will not sell the purchased wild horses or burros to slaughter. I want to thank every person who called their Senators and Representatives, and the members of Congress who worked hard to change this cruel, inhumane and deadly policy. Your voices were heard, and you do make a difference. I am now going to move onto the bad. The BLM has issued a press release last week that proudly announces a new financial incentive that encourages people to adopt wild horses and burros. Now, the adoption fee has been lowered from $125 to $25, and “qualified adopters” are eligible to receive $500 within 60 days of the adoption date, and then another $500 within 60 days of titling which is normally after one year. This is one of the worst ideas that the Bureau of Land Management has managed to come up with in recent years. Previously, the adoption fee of $125 and the requirement of having to keep the wild horses or burro for one year before receiving title were used as deterrents for people who just wanted to turn around and make money selling them to slaughter. Now, with the cost of any upkeep for the year of the horse or burro paid for, this “adoption” becomes an irresistible money making opportunity for people who will keep them just long enough to get their $1000 and then sell them and make even more money by selling them by the pound to kill buyers. It will also encourage people who have absolutely no business caring for a horse or any animal at all taking them and this will cause even more pain and suffering for these living beings who through no fault of their own have already lost their families, their homes and their freedom. The BLM just wants to get rid of the wild horses and burros and doesn’t really care if they end up at slaughter, just so long as they are removed from our public lands and from the holding facilities. Unfortunately the ugliest part of this story concerns wild horses held at the private facility in Bruneau, Idaho. In 2017 when the BLM was rounding up and removing wild horses from Adobe Town, Salt Wells Creek and Great Divide Basin in Wyoming, they shipped most of the wild horses to private holding facilities instead of BLM facilities that the public could go to and observe and adopt the horses. In previous roundups, the wild horses were shipped to BLM facilities in Rock Springs, Wyoming or Canon City, Colorado where the public would be able to view and to adopt these horses. However, this facility is privately owned and the BLM only allows members of the public to tour the facility and observe the horses one time per year for two hours. I went on this “tour” on June 6, 2018. I had to sit on a flatbed with hay bales on it and was driven around the pens that held the wild horses. I was told that there had been a lot of foals born, sometimes 20 per day in the previous weeks, but was not told how many or if any had died. There had been 593 wild mares shipped to this facility operated by J.R. Simplot after the Checkerboard Roundup in October, 2017. In the wild, these horses had been healthy, disease free, and capable of carrying their foals to term. This private holding facility is a house of horrors, a deadly prison for wild horses. Instead of caring for the wild horses, as they are paid to do, they are killing them and covering it up. This facility should be shut down immediately and should never house our precious wild horses again. This is the ugliest truth, that the BLM does not want you to know. Just when I think things are turning around for our wild horses, more ugliness raises it’s head. They’ll never close down this facility…the BLM has no concern over our wild horses and burros and if they are suffering and dying. Just less horses for them to worry about. And I have to wonder what else is going on at these ugly holding facilities that the BLM is keeping hidden away? 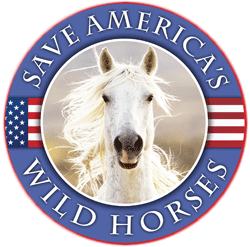 https://www.msn.com/en-us/lifestyle/lifestyle-buzz/the-federal-government-is-offering-dollar1000-to-anyone-willing-to-adopt-a-wild-horse/ar-BBUVGFk?OCID=ansmsnnews11 – putting it right out there in the “main stream media”! No urge to stop & think what the word “wild” means! Until Congress is aware of the money available to manage our herds as cultural and native wildlife these atrocities will continue. .https://www.fws.gov/laws/lawsdigest/fawild.html. Funds may be available to BLM too to relocate and rewild federally protected wild horses as distinct population segments. (Sweet Home Chapter) Land also may be acquired under section 5 of the ESA to prevent “modification of land that is not yet but may in the future become habitat for an endangered or threatened species.” Note how many times the word “protected ” species is used which is legally different from “Listed “species. This is another reason why wild horses and burros should have the same ESA available habitats for the relocation of wild horse/burro herds. Kleppe v. New Mexico, 426 U.S. 529, 96 S.Ct. 2285, 49 L.Ed.2d 34 (1976), the Supreme Court recognized the important governmental interest in preserving wild horses and burros in their natural habitat, citing congressional findings that their preservation would “ ‘contribute to the diversity of life within the Nation and enrich the lives of the American people.’ ” Id. at 535, 96 S.Ct. at 2289 (citing 16 U.S.C. § 1331 (1970 ed., Supp. IV)). The provisions of the Wild Free-Roaming Horses and Burros Act advance this important governmental interest. It appears that from the beginning of the Adopt-a-Horse program the government has taken the view that when it loans these animals to private parties, it retains an ownership interest as the means for retaining the ability to control the use made of the horses. The court held that, regardless of whether the WFRHBA intended to create an ownership interest in wild horses, the government has a property interest in wild horses that it has captured, corralled, and loaned out. . Even if the language defining wild horses was intended to have the significance which *623 Hughes attaches to it, see note 1 supra, it does not foreclose the conclusion that the government claims an interest in the horses when it captures them. The statutory definition of wild horses is limited to those “on public lands of the United States,” 16 U.S.C. s 1332(b), and yet the horses placed on private lands continue to receive protection as wild horses under the Act. The definitional language thus identifies the horses protected by the Act, but does not condition their continuing protection on the continuing existence of those identifying characteristics. Thus, adopted horses continue to receive protection as “wild free-roaming” horses even though they are neither roaming on public lands nor, strictly speaking, unclaimed. The Bruneau wild horse feed-lot is owned by the Simplot corporation and there is no doubt that they only care about getting the money and don’t care at all about the wild horses. The BLM has paid Simplot over $11 million dollars to imprison our wild horses from 2015-2018. The Bruneau wild horse facility was previously used by Simplot as a cattle feed lot. I imagine most of us have seen cattle feed-lots and if not then use google earth to see how the animals are packed in… which of course means disease will run wild (regardless of abundance of disease fighting chemicals used on cattle) and would subsequently infest the soil with these bacteria for years to come which would point to an explanation of the high death rate of our wild horses at this facility. Thank you, Carol, for your insightful facts and explanation of the current good, bad and ugly. Really. Just eyerollingly euphemistic or just plain not being honest. Just come right out and print that they don’t care for them much at all – no shelter from the heat, water, chased by helicopters, and I saw at least one video of a guy repeatedly kicking a burro. Wouldn’t I love to have confronted him. Any other person or organization warehousing so many animals in such conditions would be rightly accused of hoarding. Since it’s clear the largest hoarder is in fact the BLM, could an argument be made they somehow need them as “comfort animals” themselves? I am willing to bet many are glad for their “care” paychecks as well as happy to see so many forcibly removed from their legal rangelands. Okay so where’s the enforcement of the signed form that says the buyer won’t sell the horse? Where’s the definition of “qualified” and who’s going to keep an eye on that? Who is the designated BLM employee in charge of all of this? Thanks for posting, Carol. The BLM rounded up 11,472 wild horses and burros in 2018 and permanently removed them from our public lands. This is almost 3x more than they removed in 2017 and more than they have rounded up and removed in almost a decade. Now with the holding facilities and off-Range corrals full the BLM is desperate to empty these out so they can round up and remove more wild horses and burros this year. After all these years, my family and I made our first trip to see the wild horses of the western United States. My work has been dramatically influenced and inspired by the study of these horses and their hooves. So, I walked into wild horse country thinking that I was on a tourist trip; confirming what I already knew. I could not have been more blind. I could not have been more wrong. They were much, much more than I had ever imagined. What I write here, will probably sound very similar to what my predecessors have written. I don’t know if anyone’s words can get the point across to the world, but I have to try. I thought I was ready, but what I saw literally blew me away. I have worked on thousands of horses, all over the world. I spent six years of my life in the saddle from daylight till dark. I’ve had the privilege of working on some of the finest horses, for the finest horsemen in the world. Understand that after two minutes with the wild ones, I knew that I had never seen a true horse. I literally had no idea of their potential. The true wild horse is an endangered species, because true wild horse country is almost gone. We had better learn to treat them as such and get all of the answers we can from them before it’s too late. The area we were in had been under heavy snow until a few weeks prior to our arrival. The horses were eating tiny green shoots of new grass emerging from the cracks in the rocks. They would find about one nibble, among the rocks, per two steps. Using gridded topo maps, our calculations confirmed they were, in fact, moving at least twenty miles per day in this rugged landscape. Interestingly, there were a few areas under wooded sections that had decent stands of grass and soft, wet footing, but it was rare to see any sign that a horse had been in there. Theypreferred the open spaces and high, rocky ridges where they could see around them. The mares were dropping foals while we were there and both the mares and the foals were extremely healthy. What in the world did they eat all winter? The grass would have been covered with snow, if it existed at all. I found more questions than answers. These horses were all visions of health, but this soon after the snow melt, they should look their worse, I would think. I can’t wait to see the same horses in the summertime. One day, we took a road trip to a BLM holding facility. Some of the horses there had arrived from the wild only six weeks ago. We were eager for the opportunity to get some close-up photos of them, but they were not even remotely similar to their brothers and sisters in the wild. The care of the horses at the facility was great, by domestic standards; in fact it was exactly what I recommend at home. They were kept in herds, with clean, dry, hard packed footing, and were fed free choice grass hay. They had “plenty” of room and reason to move. I would consider it a perfect spot to rehabilitate a foundered horse. In spite of this, the glow, the vigor, the energy and the startling health was gone, and so were the perfect hooves………. After only six weeks of domestication in what I would consider a good “natural boarding” situation, the spell was broken. There were nice horses there, don’t get me wrong, but they were only shadows of their former selves. The magic was gone. This proved to me beyond all doubt that these “magical creatures” are not a “super breed” or a separate, genetically selected sub-species. It is the diet, the environment and the movement alone that makes them so special. Our wild horses and burros need to be protected from roundups and slaughter from BLM. It is cruel and inhumane what they are doing. These animals don’t deserve this. They are icons of the west and have been living off the land for hundreds of years and is all they know. It’s all about the cattlemen and BLM or this wouldn’t be happening!!! Save our wild horses and burros!